Craig A. Plesco, 1986. 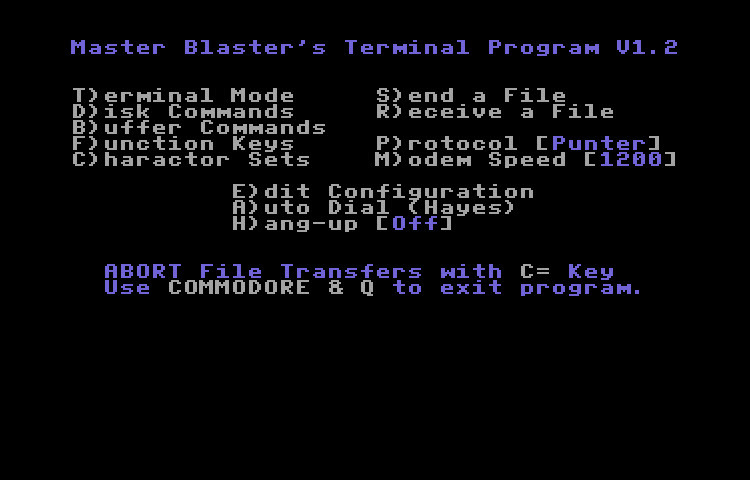 Nice little terminal program with C/G mode, Punter transfers and even a built-in mini-bbs. Unfortunately it is limited to 300 baud. 1987, Stephane Laroche. This is a surprisingly nice terminal package with all the bells and whistles for the time. nice size buffer, punter transfers, 40/80 column c/g mode, etc.. check it out. 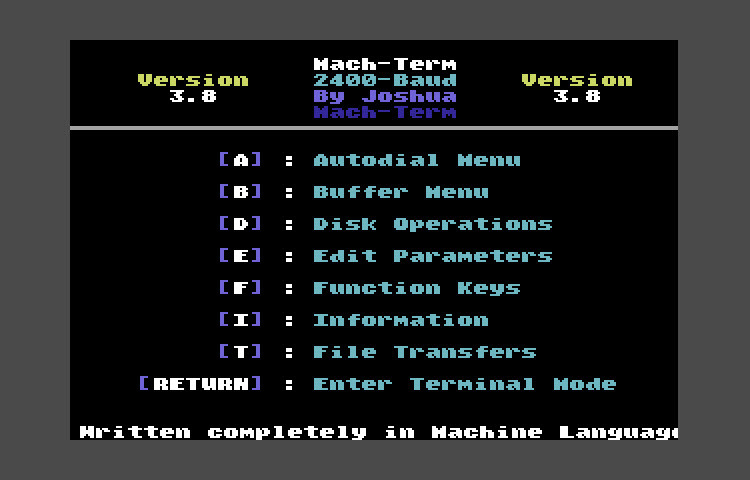 By Joshua, based on v3.7 written by Michael Garber completely in machine language. 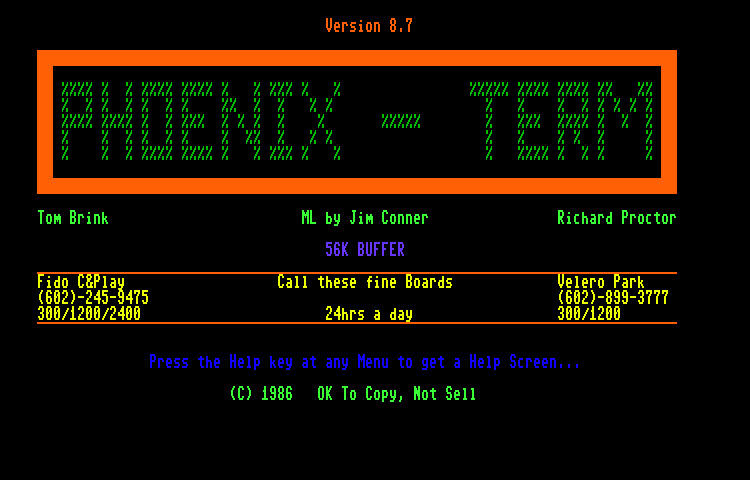 Feature 300-2400 baud, 24k buffer, xmodem & punter transfers, etc. Really excellent term. 1986 by Laura M. Young. 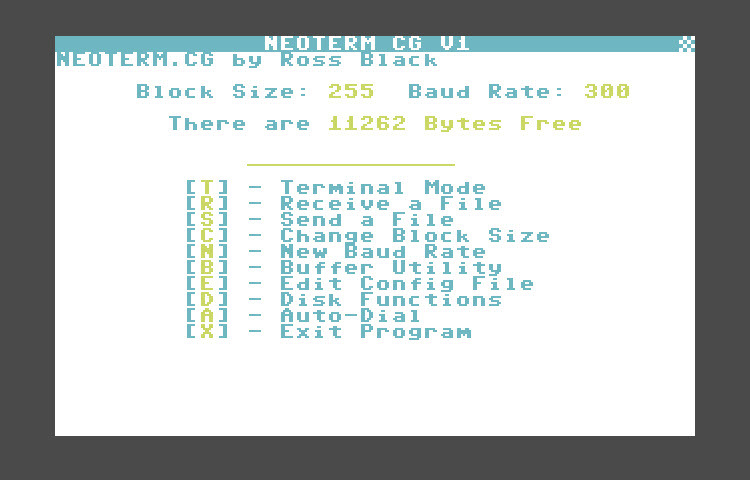 Cool c/g terminal that supports up to 1200 baud. 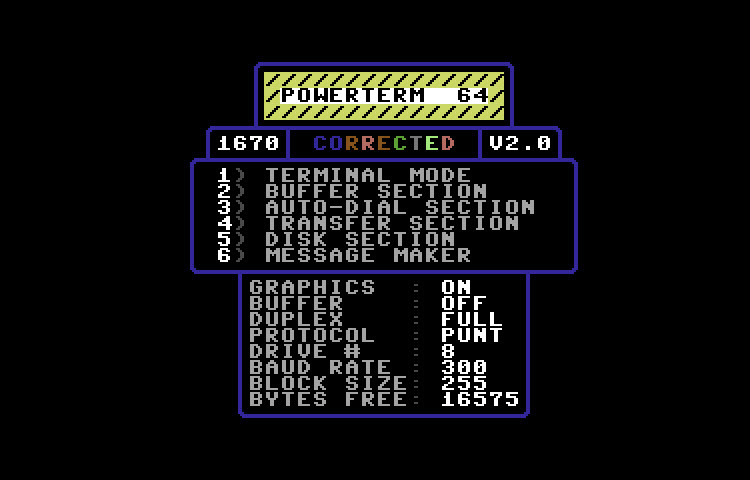 Only 8190 byte buffer. By Andy Prince, July 1987. 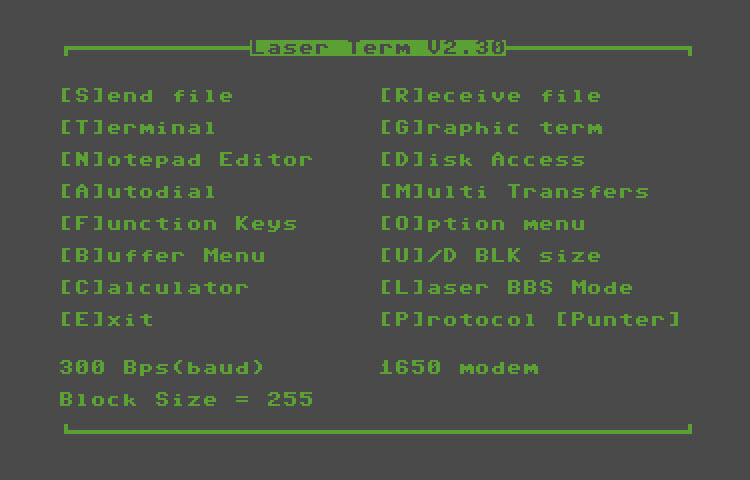 C/G, 1200 baud, Punter protocol & designed specifically for the 1670 modem. Nice looking term program with multiple character sets. Supports 300-1200 baud & Punter transfers. Don't remember this term when I was a kid, but it looks pretty nice and although there is a version 1.2 on the site, it doesn't have the cool font this one uses. 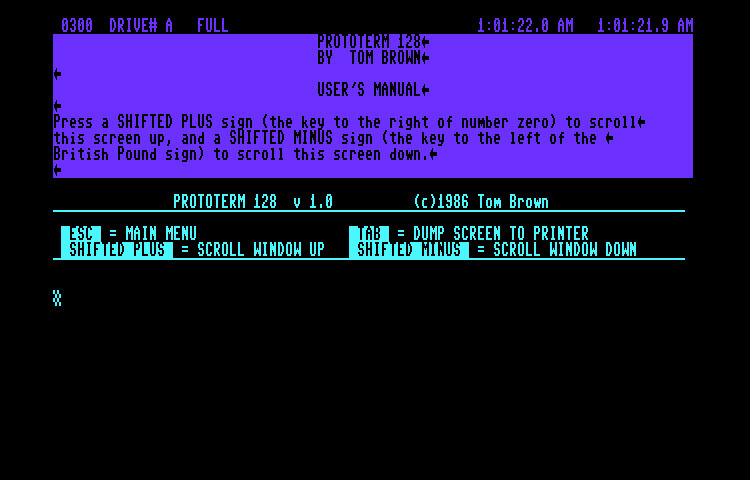 By Scott Maxwell and Don Malette Jr. Nice simple terminal program with buffer functionality. Presented by The Omega Warrior - This term supports color graphics and multi transfers. There are some basic docs on the disc. 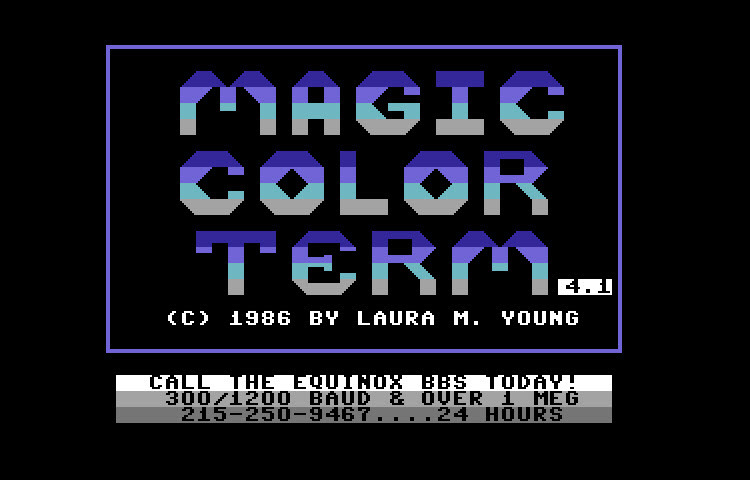 Merlin the Magic Term v1.1 1986 Lone Wolf, Studdly Boulderock & Star Dust. 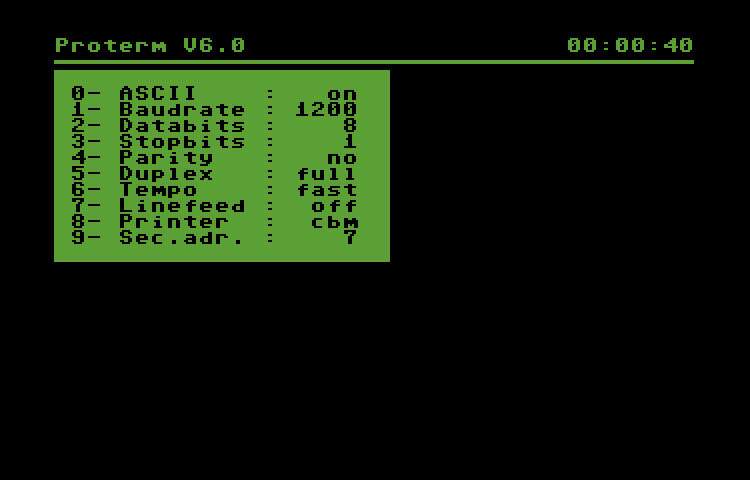 Decent terminal program supporting the 1670 and C/G. Isepic'd though, hopefully I'll run across a non-snapshotted version. Released April 8th, 1986 by Joe O'Hara. 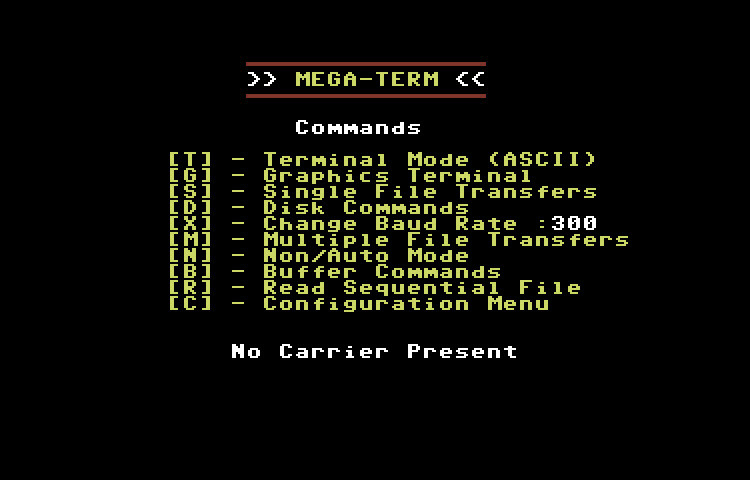 Simple 80 column term with Xmodem transfers and built-in help. 1986 by Joe O'Hara. This version released on July 24th, 1986. Add new modem type of generic RS232. 1984, Robert S. Shaw, standalone mod by Chris Kaiser. 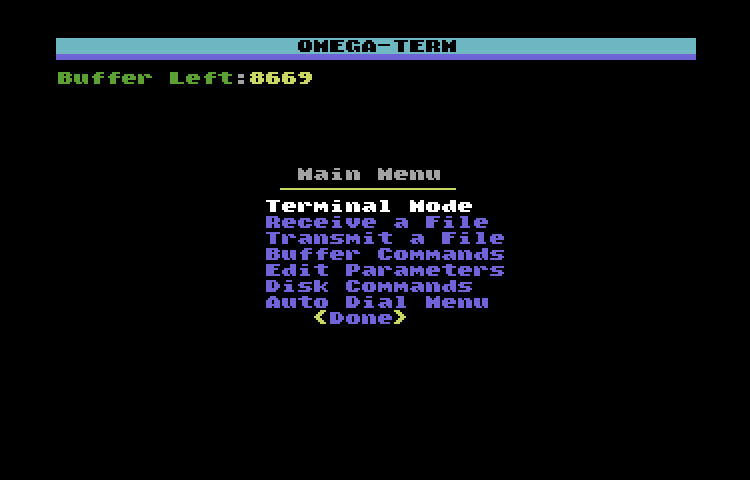 Basic terminal program supporting the 1650 and possibly others because it will go up to 1200 baud. Wish I had the source code for this one. Clean and simple. 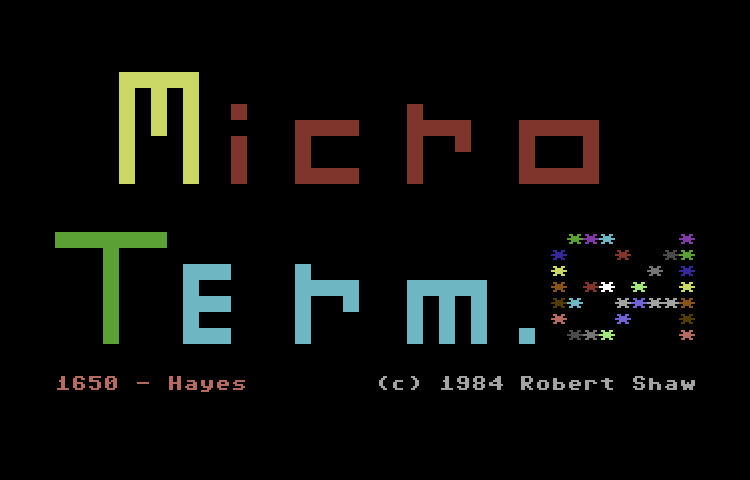 This is the fully BASIC un-compiled version of Microterm 64. Great place to start if you are looking for a BASIC example of the Punter protocol. 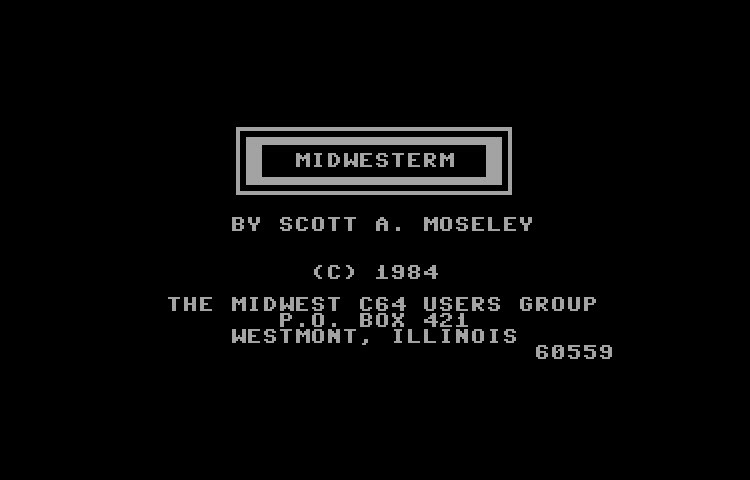 By Scott A. Mosley, 1984 - This is the terminal program that Eagle Term is based on. By Scott A. Moseley,1984. 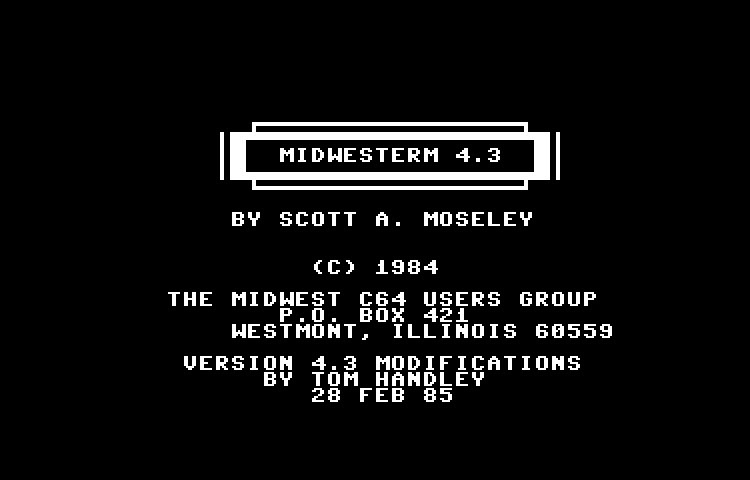 v4.3 modifications by Tom Handley on Feb. 28, 1985. This is a newer version of Midwesterm that supports Punter transfers. 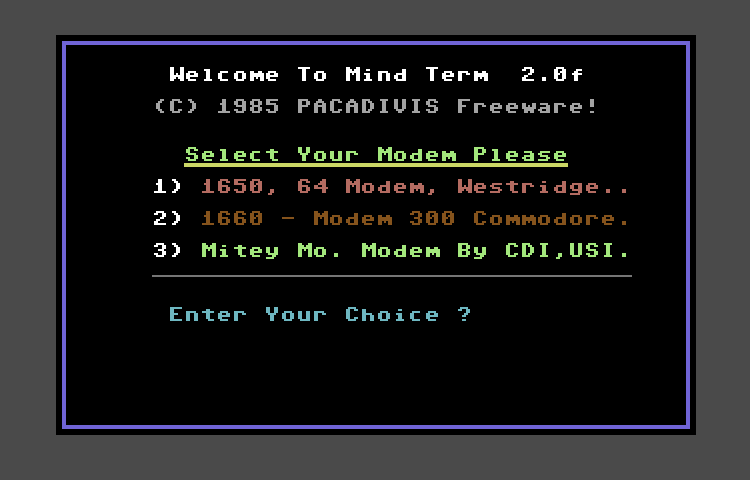 Mind Term 2.0f 1985 Pacadivis. Written by Paul Andrew Viscovich. 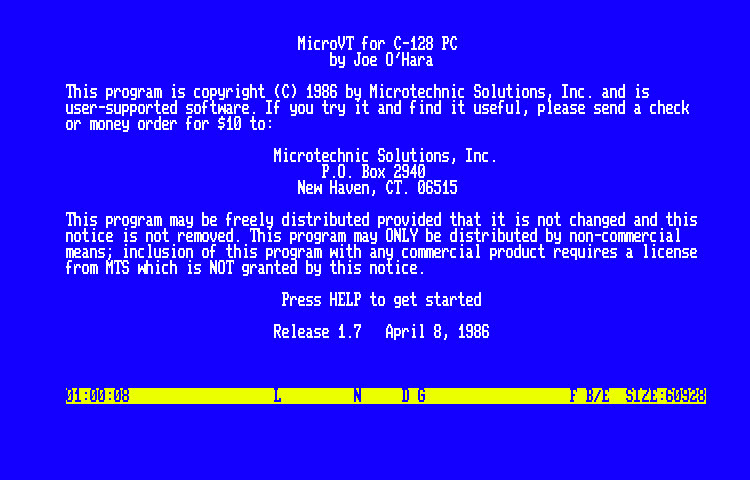 This seems to have been a pretty advanced terminal program for it's time. 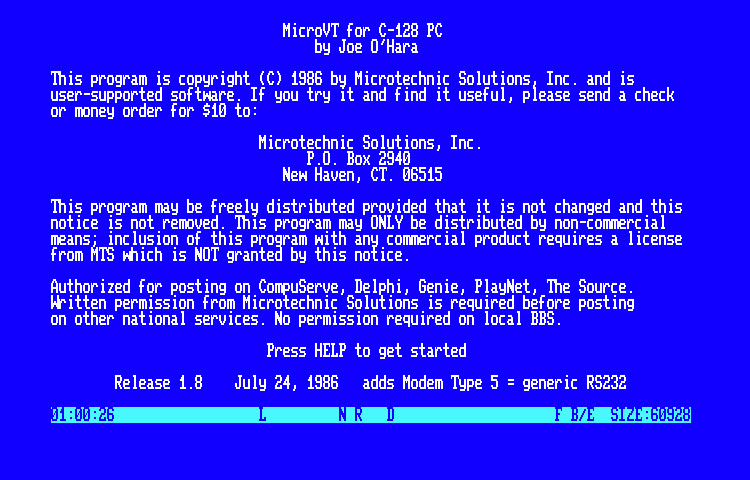 It supported both Xmodem and Punter along with buffer functions and printer support. 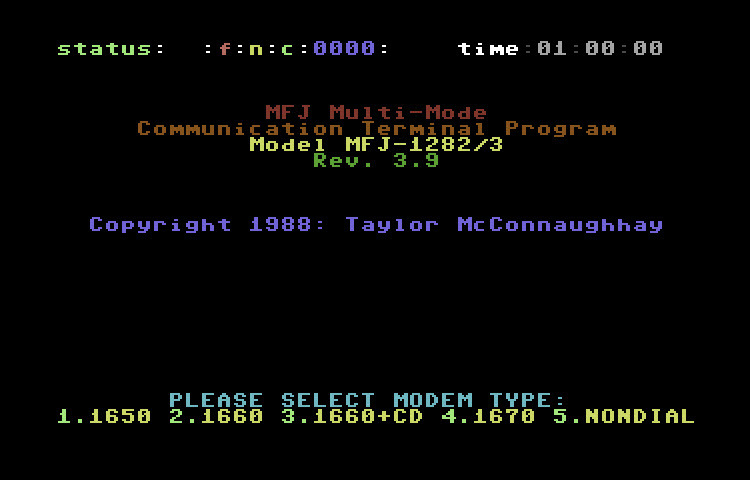 1988 by Taylor McConnaughhay - This disk came with the MFJ-1282/3 Packet modem. I believe it's for HAM stuff. By Andy Kovacs & Brian Gann. Not much info on this program. My guess is it could be used to do full disk transfers of lightly protected disks. 1990 by MFJ Enterprises, 07/30/1990. 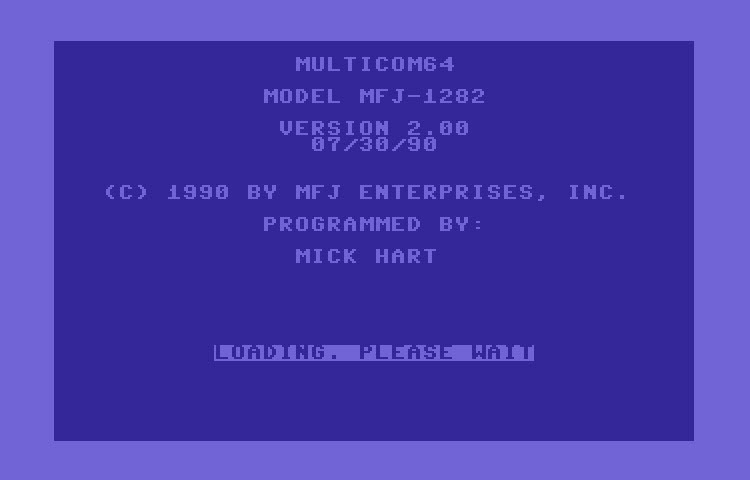 Programmed by Mick Hart - As far as I can tell, Multicom was released for a particular modem and appears to support faxing. Original by Scott Garnik, Neoterm by Ross Black - Neoterm is color graphics term program with 11k buffer and transfer capabilities. Works at speeds up to 1200 baud in hardware. 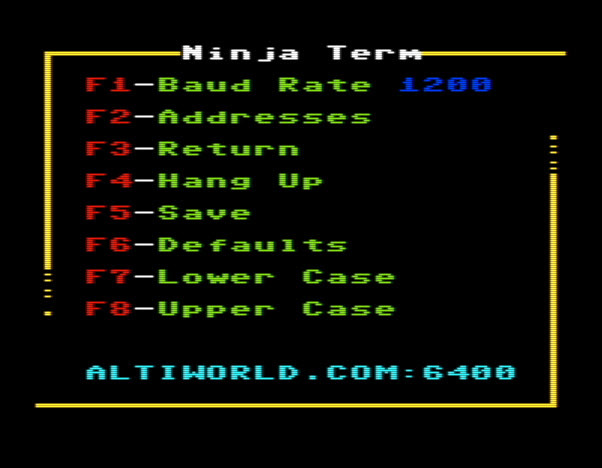 NinjaTerm will run on any 16k VIC-20. Future versions may require 24k. 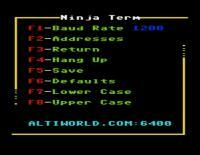 NinjaTerm works with all userport modems, including new Wifi Modems and tcpser based modems. Nothing super fancy with this term program, but it does use a custom font which I've always liked. 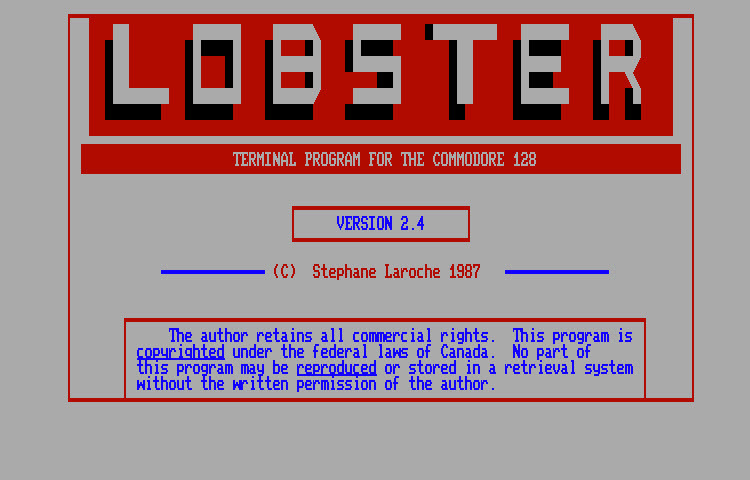 It has a 8.5k buffer and supports file transfers. 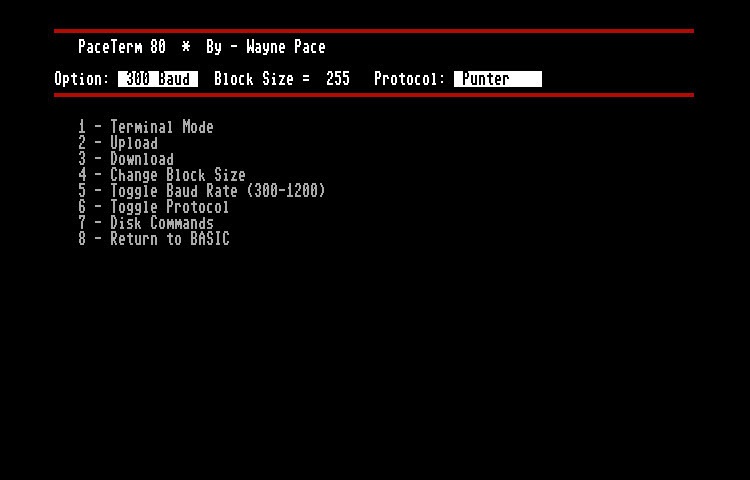 By Wayne Pace - 80 column, Hayes / 1670 terminal with punter / xmodem protocol and 300 - 1200 baud speed. 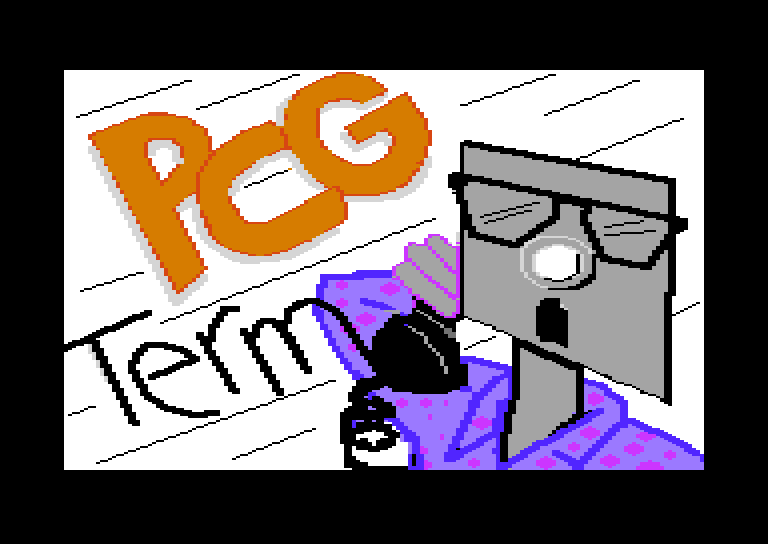 PCG Term was released in 1988 by EGBell - pretty nice terminal program with support for 15 different fonts. 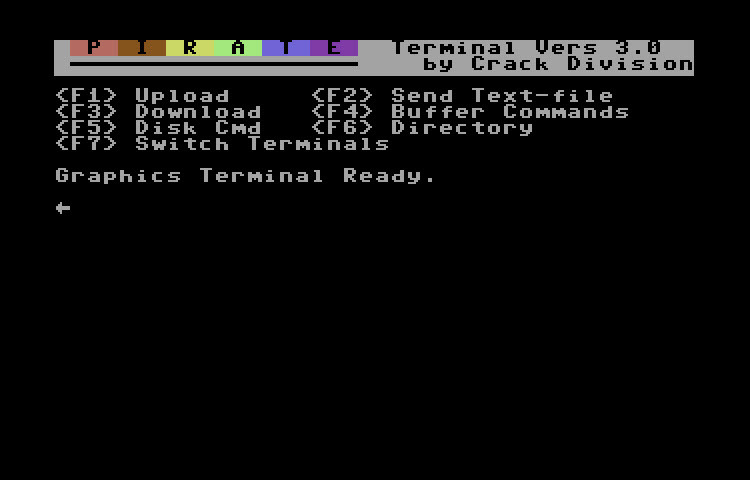 Docs are also included on the disk. 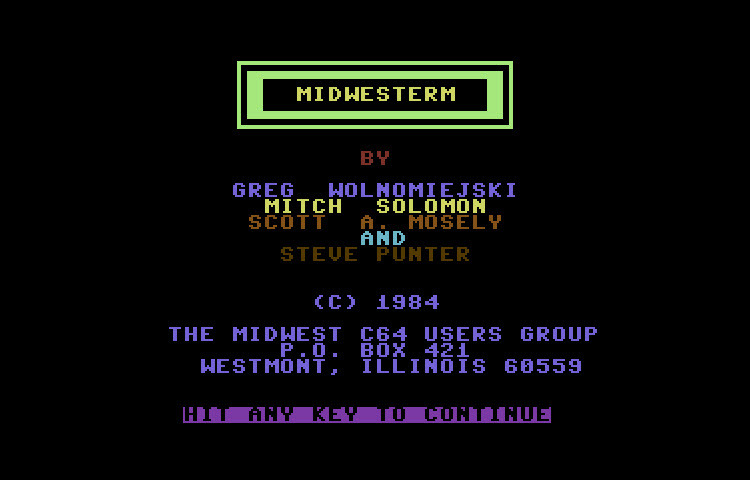 1986 By Tom Brink, Jim Conner & Richard Proctor. 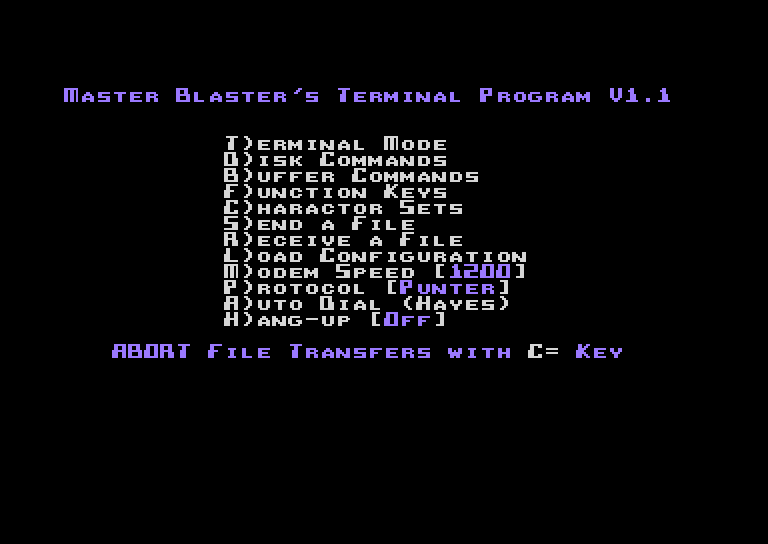 80 Column only, 56k buffer, 300/1200/2400 baud. By Crack Division. This is almost surely a hack of a very early CCGMS. I like it though, because its only 18blocks and is perfect if you dont need multi transfers and other fancy stuff. Written by: AutoCat. Supports Punter protocol. Written by Paul Aidukas (c) March 1988. 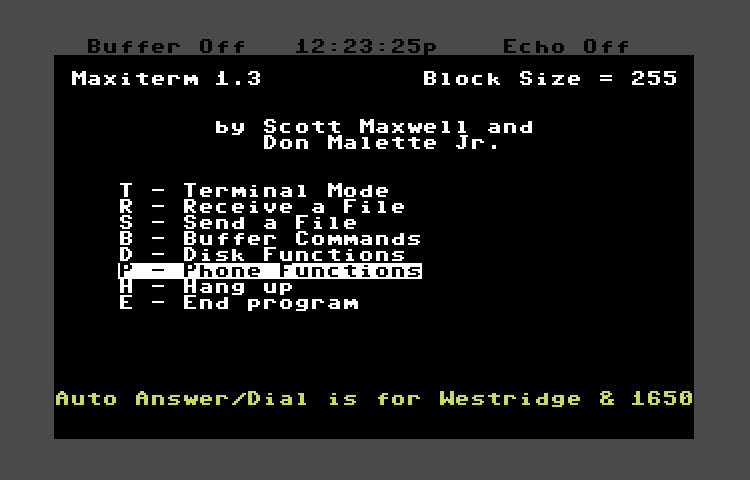 Quite a nice 80 column only terminal with 53k buffer, multi-punter, full buffer utility, 300 - 2400 baud, split screen chat and much more. 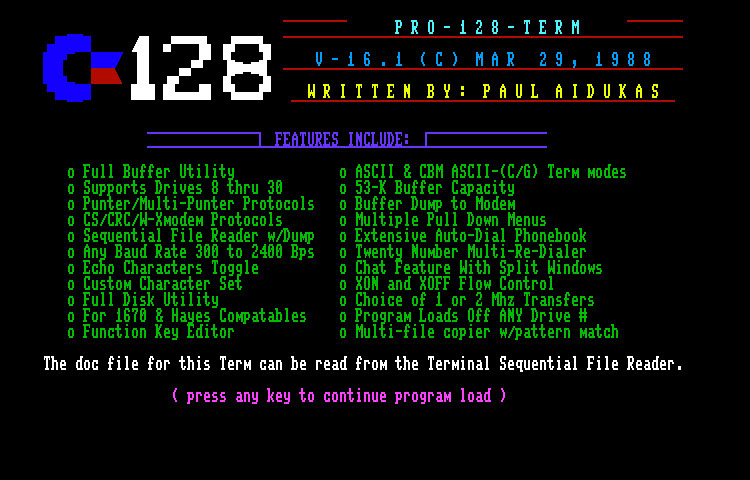 Pro-128 Term v12 by Paul Aidukas. 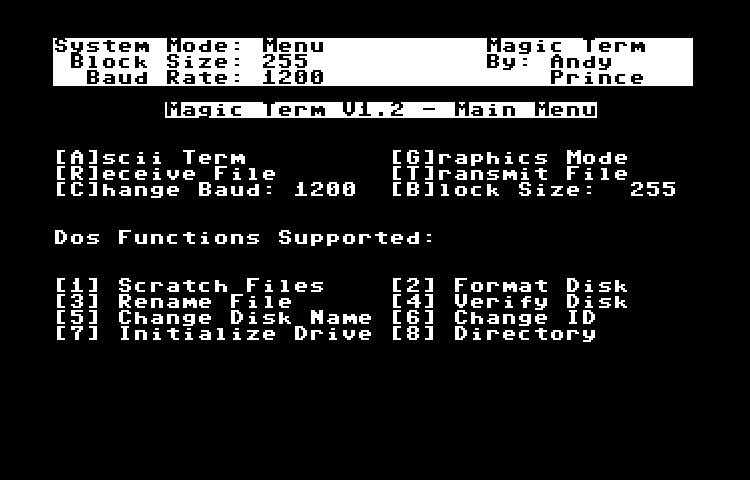 This isn't the newest version of this terminal program (V16.1 as of 10-12-2017 is the newest I have) but it's nice to have for history sake. 1986 by Tom Brown. 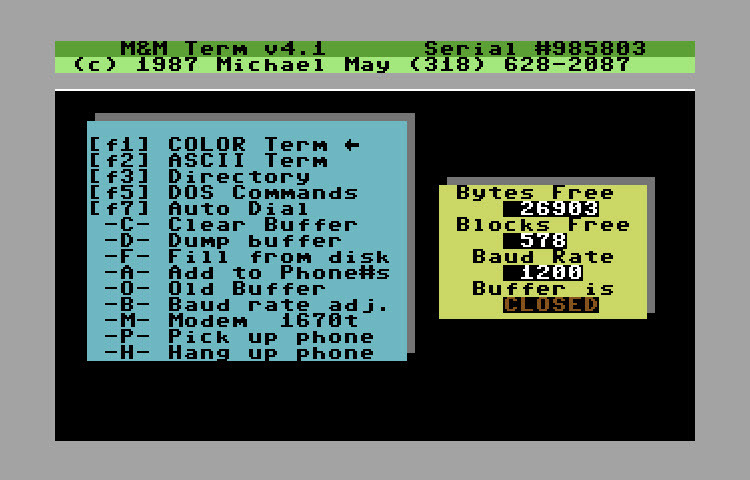 80 Col terminal package withfull docs on disk.